CNC forming - Flexible forming via our custom built, CNC forming process, fondly referred to internally as “victor” process. “iBend” automated forming capability -The latest new metal forming technology is known as iBEND, is an automated bending process with proprietary bending mechanisms. This type of technology has been the forerunner among all automatic bending equipment in the die making industry for nearly 15 years. This new process is fully computer driven and includes four tooling modules, each with up to five position tools. Optimized hydraulic forming presses with special tooling. All of these processes are fine tuned to show full capability on the toughest of metal forming requirements. If your project could benefit from a better forming solution, then contact us today! 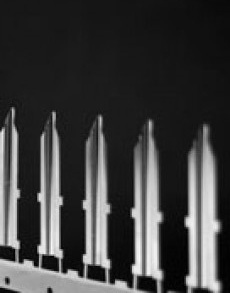 Deburring is also a critical part of the ultimate product, so multiple means of deburring are applied to the customer products we manufacture based on the ultimate application.